Tridel Recognized at BILD Awards with 9th Green Builder of the Year Award. 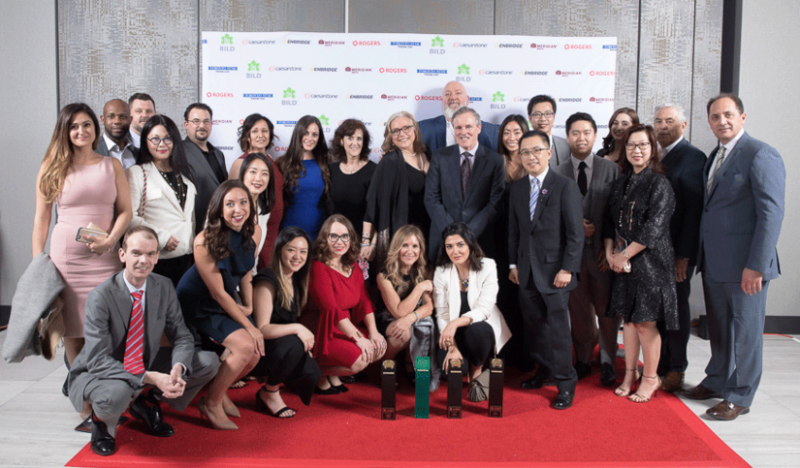 Tridel’s success as a builder was celebrated on Friday, May 4, 2018, at the 38th annual BILD Awards, a gala event to honour the GTA’s very best in new residential construction, design, marketing and sales. Tridel, the country’s foremost condominium developer, was awarded the prestigious Pinnacle Award for Green Builder of the Year (Mid/High-Rise) for the third year in a row. After winning the inaugural award in 2007, Tridel has earned the Green Builder distinction 9 times in the last 12 years, more than any other builder in the GTA. Since the early 2000’s, Tridel has been an industry trailblazer in sustainable building practices and have worked closely with trades and partners to develop new technologies and innovations. In 2005, Tridel made a commitment to building to the LEED® (Leadership in Energy and Environmental Design) standards administered by the Canada Green Building Council and since 2010, Tridel communities have been built to comply with Toronto Green Standard Tier 2, a voluntary green building standard over and above the Tier 1 standard mandated by the City of Toronto. In fact, a typical Tridel building consumes at least 30% less electricity, 45% less natural gas and 40% less potable water than a Model Reference Building. “At Tridel, we are dedicated to being an environmental leader in our industry, not just because it’s a smart thing to do – for our homeowners and ourselves – but because it’s the right the thing to do,” says Adrian Wang, Innovation & Sustainability Director at Tridel. With over 18,000 green suites to date, we believe that creating homes that are more energy and resource efficient with environmentally responsible materials is not only financially beneficial for our homeowners, but are also healthier places to live. For a complete list of this year’s BILD winners, visit www.bildawards.ca/winners.